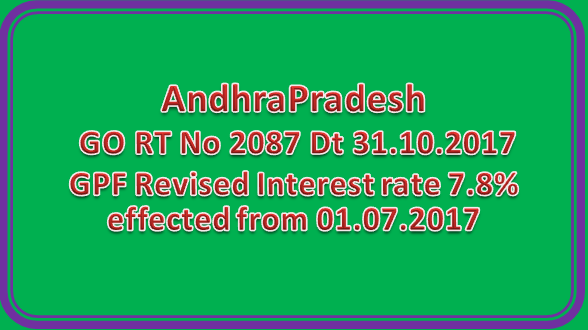 Provident Fund-Interest rates on General Provident Fund (Andhra Pradesh) for the subscribers of GPF and other similar funds as 7.8% (Seven point eight percent) per annum with effect from 01.07.2017 to 31.12.2017 for the year 2017-18 – Orders Issued. 1. G.O.Rt.No.1171,Finance (HR.5) Department, dated 17.5.2017. 2. GOI, Resolution No.F.No.5(1)-B(PD)/2017, Ministry of Finance, Department of Economic Affairs (Budget Division), dated 17.07.2017 & 23.10.2017. According to Rule 13(1) of General Provident Fund (Andhra Pradesh) Rules Government shall pay to the credit of the account of a subscriber interest at such rate as may be determined for each year according to the method of calculation prescribed from time to time by the Government of India for payment of interest on subscription to the General providdent Fund in respect of Central Services. 1. In the G.O. 1st read above,the State Government have adopted the interest rate of 7.9% per annum with effect from 1.4.2017 to 30.6.2017, as ordered by the Government of India. 2. In the reference 2nd read above, the Government of India through resolution No. F.No.5 (1)-B(PD)/2017, dt. 17.7.2017 & 23.10.2017 announced the interest for the subscribers of General Provident Fund (Central services) at 7.8% for annum for the period from 01.07.2017 to 31.12.2017 during the year 2017-18 on the following Provident funds and other similar funds maintained by the Government of Andhrapradesh on par with rates of Government of India. The G.O. is available on Internet and can be accessed at the address http://www.goir.ap.gov.in.